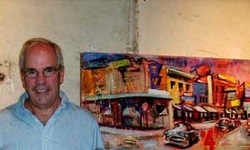 Bill Colt is an award winning mixed media painter from Monroe, NC. He has a degree in art from the University of Virginia, and also studied graphic art at Johnson and Wales. If you look closely at Bill's paintings, you may be surprised by what you find; he uses collage from old magazines, comic books, album covers...whatever....to give his brightly colored works an underlying "graffiti" look. ﻿On this page you will find the Bill's original paintings that are available for purchase at the AT Hun Gallery. Click on the thumbnails below to see full-size images of the paintings. Please contact us for information on pricing, shipping of original paintings. ﻿Originals﻿ cannot be purchased online.